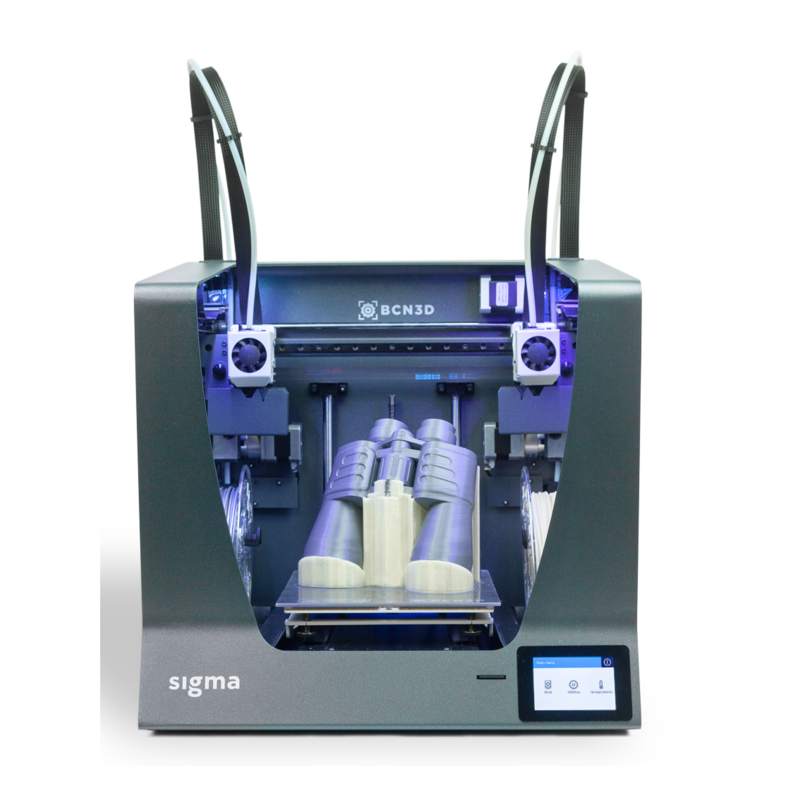 Buy the BCN3D Sigmax R19 and you'll get a durable, solid and intuitive 3D printer for your desk. The system comes with Independent Dual Extruder System (IDEX). This enables you to add high-resolution multi-material parts in a simple and effective way. Maximum processing quality: Components built into the nozzle and the heat brake are precisely processed. QC'd guarantees optimum quality standards. Optimized heat dissipation: Greatly improved heat sink and heat sink geometries enable better heat transfer. This reduces the problems of underextrusion caused by heat transfer. At the same time it guarantees a functioning extrusion in different working environments. Improved electronic components: The heating element with narrow resistance tolerance ensures reduced differences in the thermal behaviour of different hot ends. The newly developed thermistor cartridge improves heat transfer and enables more precise measurement and more uniform extrusion of the liquid filament. Assembled by E3D: The assembly process and quality control, carried out by a competent team of experts in an innovative assembly line, guarantee a masterpiece throughout the entire application. Unparalleled grip: A dual drive gearbox proves to be the most suitable material feed system to guarantee durable, high quality extrusion and eliminate grinding problems regardless of the filament used. Increased torque: An extruder mechanism with planetary gear guarantees a powerful torque. This effectively reduces underextrusion problems. Improved extrusion monitoring: The gear allows a more precise extrusion rate for 3D printing of complex components. An easy-to-use and powerful filament status detection system: A mechanical switch detects the availability of filament in your 3D printer. This prevents one of the most numerous and annoying causes of error – the end of the filament and thus your 3D printing. Automatic 3D printing pause: If the filament runs out during a manufacturing job, the 3D printer automatically stops and warns you to insert new filament to continue the manufacturing process. This feature saves you time and money. Extensively tested: Multiple optimizations and thousands of hours of 3D printing ensure consistent performance throughout the life of the 3D print. The optimized graphical user interface comes with new functions, wizards and provides you with a lot of information. Experience simple and convenient control. Easy to use screen: Operate your Sigma R19 intuitively via its built-in display. Maintenance alert: This 3D printer reminds you when it's time to wait, grease, and oil. Choose the parameters yourself: Now set material flow rates and fan speeds for material cooling for each hot end independently. Change wizard for hot ends: Change the hot ends quickly and easily using the integrated wizard. Hot ends detection: Detecting the attached hot ends simplifies the calibration process and reduces faulty G-code configurations. More material presets: The Load Filament Assistant now comes with more material presets. This makes additive manufacturing easier and optimizes your results. Calibration process improved: The internal calculations are designed to get a repeatable 3D print result. Thanks to the mirror and duplication modes, you can now take full advantage of the IDEX architecture. BCN3D Cura 2.1.0 works together with Sigma and Sigmax R19. The Mirror and Duplication 3D printing modes help to make the most of the 3D printer. Buy the BCN3D Sigmax R19 and 3D prints with the IDEX system and its two independent extruders on a professional level. Warranty 2 years for EU countries. 1 year for non-EU countries.